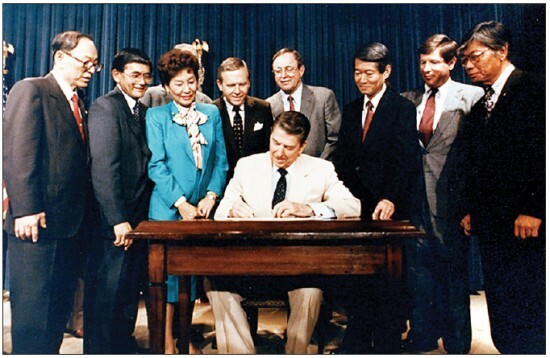 President Ronald Reagan signs the Civil Liberties Act on Aug. 10, 1988. From left: Sen. Spark Matsunaga (D-Hawaii), Rep. Norman Mineta (D-San Jose), Rep. Pat Saiki (R-Hawaii), Sen. Pete Wilson (R-Calif.), Rep. Don Young (R-Alaska), Rep. Robert Matsui (D-Sacramento), Rep. Bill Lowery (R-San Diego) and National JACL President Harry Kajihara. The Japanese American National Museum, 100 N. Central Ave. in Little Tokyo, will host the 2013 Day of Remembrance program on Saturday, Feb. 16, from 2 to 4 p.m. This year’s Day of Remembrance is themed “The 25th Anniversary of the Civil Liberties Act of 1988: Our Struggle, Our Perseverance, Our Commitment,” and is sponsored by JANM, Nikkei for Civil Rights & Redress, Japanese American Citizens League-Pacific Southwest District, and the Manzanar Committee. It will highlight the various efforts, grassroots and legislative, that ultimately led to the signing of the redress legislation. To mark the anniversary, this one-day event will bring the audience into the era of redress with footage from the Los Angeles hearings of the Commission on Wartime Relocation and Internment of Civilians and voices from some grassroots, yet prominent redress figures and experts. There will be a shakuhachi musical performance by George Abe. In addition, there will also be a special tribute to late Sen. Daniel Inouye, who not only led the Japanese American community but all people of color. The 2013 Day of Remembrance will be emceed by Stephanie Nitahara, regional director of JACL PSW, and Soji Kashiwagi, executive producer of the Grateful Crane Ensemble. The panel will be moderated by Bruce Embrey of the Manzanar Committee. There will be a reception at the museum following the program. For more information, call JACL PSW at (213) 626-4471.